Death positivity is simply embracing that part of ourselves that we so often deny: our mortality. As an extension of embracing mortality, it’s also being willing to move towards dying, death and the dead. By that definition, being death positive doesn’t mean that you wear black all the time and avoid the sunlight at all costs. It doesn’t mean that suicide ideation is your go-to for a good time; nor does it mean that you rejoice anytime and everytime someone dies. I just had a gentleman come into the funeral home to make a payment on his brother’s funeral bill. We were talking about funerals and death, and out of the blue he said, “My biggest fear is that 10 years after I’m gone no one will remember me.” We talked some more and we arrived at the conclusion that the reason we don’t talk about our dead isn’t because we don’t love them, but because we’re afraid it’s taboo to talk about them. But, it isn’t taboo. It isn’t morbid. It’s honest, loving and human. Keep your dead alive by actively remembering them. The most death positive people in the world are usually those that are closest to death. I’m not against nursing homes or rehab centers. We certainly need them, but the fact that they house the most death positive people in society, thereby cutting them off FROM society, makes it really hard for those of us who are younger to learn from their wisdom and mortality acceptance. Nursing homes are essentially taking much of our financial inheritance, but more problematic is they take our death positive inheritance that should be passed down from one generation to the next, from the older generation to the younger generation. I know. They’re awkward. I’ve been to thousands of them. And it’s easy to find excuses to NOT go. But funerals are one way WE cope and acknowledge death. They are, in their most basic form, a communal embracing of death. worked, thought and wrote; they loved and fought, enjoyed life and suffered. You can also bring to mind your inheritance, and how you should will “Caleb Wilde” as sole heir of all your cash. Not cats. Cash. Those older ladies who send out condolence cards on the daily? They’re the OGs of the Death Postive Movement. A card. A kind Facebook message. A plate of bacon given to your bereaved (non-vegan, non-Jewish and non-Muslim) friends. Saying the name of your friend’s deceased loved one. These small acts go a long way. This is an actual thing that is taking off in parts of Asia. 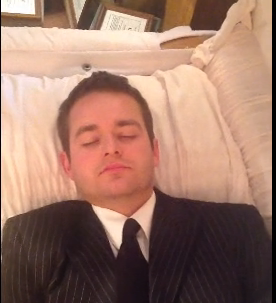 You lay inside a coffin (or casket), contemplate your death and let death wash its life over you. From my readings, most participants find it very enlivening. Although, from personal experience, make sure you choose the deluxe Tempur-Pedic casket if your “coffin therapy” lasts for more than two hours. Mortality isn’t just about death, it’s also about all the things that make us limited, needy, vulnerable, hungry, sexual and human. We have been conditioned by our religious heritage and by societal mores to shame many of the things that come with our mortality. Instead of shaming, embrace. It’s not morbid to talk about your death, or ask — say your parents — about their death. This is healthy. It’s healthy to recognize the inevitability that you, and I, will die. And it’s important to express your dying desires through a living will, and how you want your death arrangements to look when it happens. If you cared for them in life, care for them in death. Death care isn’t rocket science. Nor do death bodies harbor the plague. If love tells you to care for your dead, do it. 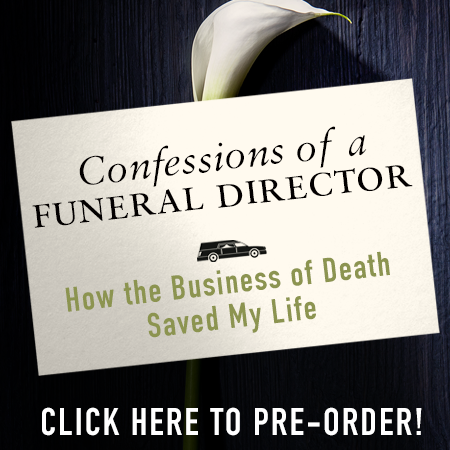 Find ways to work with the funeral home, or have a home funeral. The more active you can be in caring for your loved one, I believe the healthier your grief. Ten. 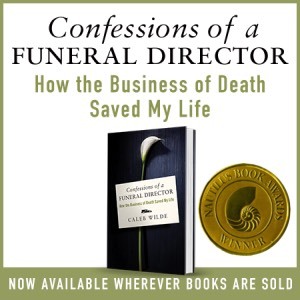 Read books about death positivity. If you liked the content of this article, (in Billy Mays voice), BUT WAIT. THERE’S MORE. The ideas that you just read are the essential elements that I write about in my new book. If you don’t like the book, I’ll give you a “Two for the Price of One” coupon to our funeral home.